I suppose it's no secret that I'm a pretty big Bioshock fan. 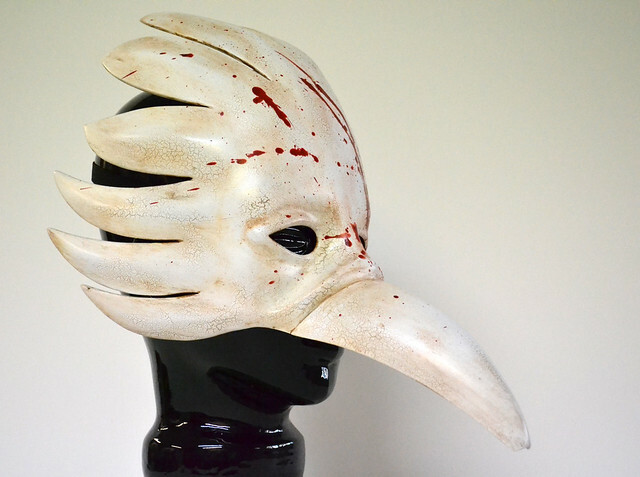 Infinite is just around the corner and I'm really looking forward to all the props that game will open up to me, but before that there was one thing still in Rapture I wanted to have a crack at building.If you're like me and want to take a pass at making your own Splicer mask, I sell raw styrene copies of the finished mask in my store, ready for trimming and paint! Gathering reference was a bit tricky here. I don't have the PC version of the game and though someone unfolded a pepakura model of the mask some time ago, it has since disappeared after the demise of Megaupload. Nothing to do then but fire up the game! One of my save files happened to be very convenient as Jack was wearing the Big Daddy suit and the splicers would ignore him. Perfect for reference. 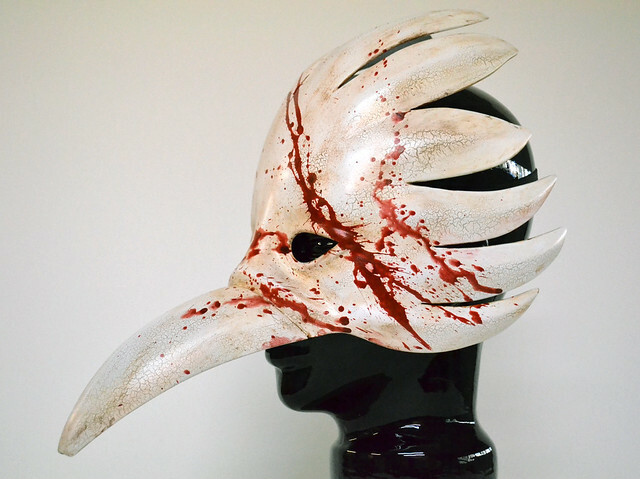 I found a bird splicer, dispatched the poor fellow, then used the "Telekinesis" plasmid to get about a hundred different views of the mask. 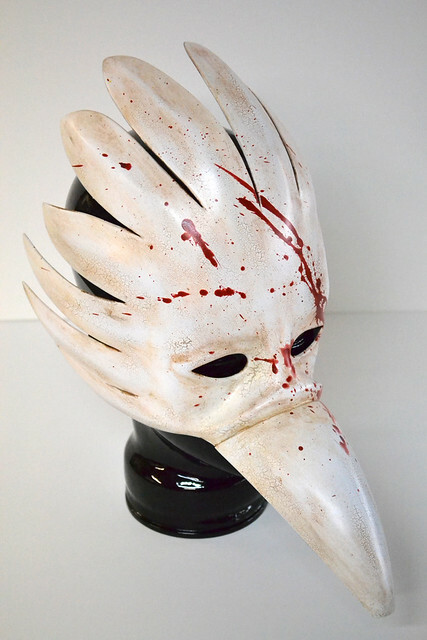 The eye area of the mask was actually pirated from a glass wig head in my shop. 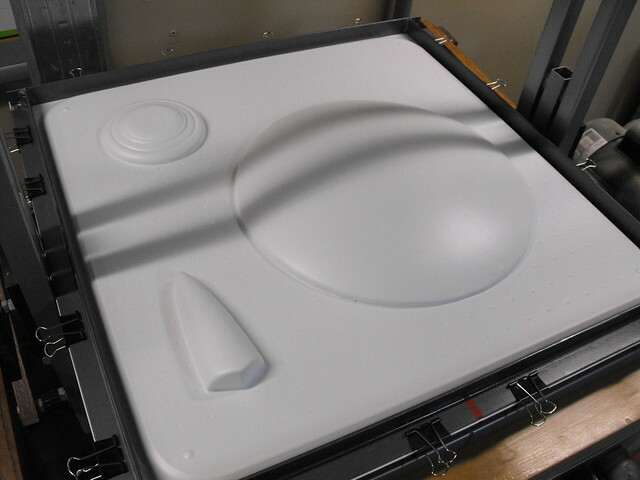 I took a scrap chunk of 0.1" styrene and heated it over the form, pressing it into shape as it cooled. 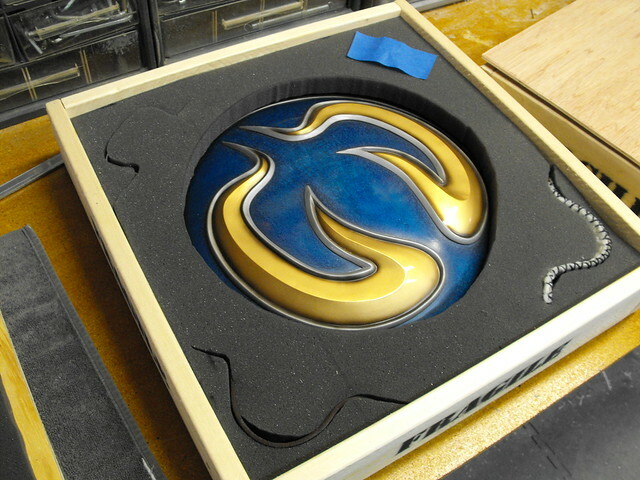 The resulting piece was trimmed down and glued to the MDF and foam frame. 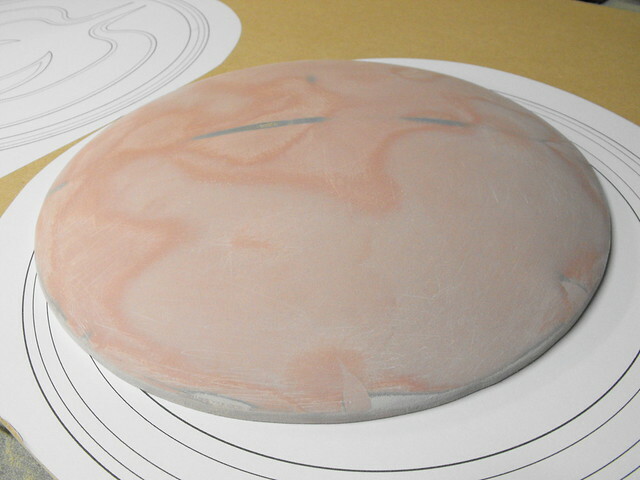 Bondo was then used to blend the styrene into the foam panels and make the entire dome more uniform. 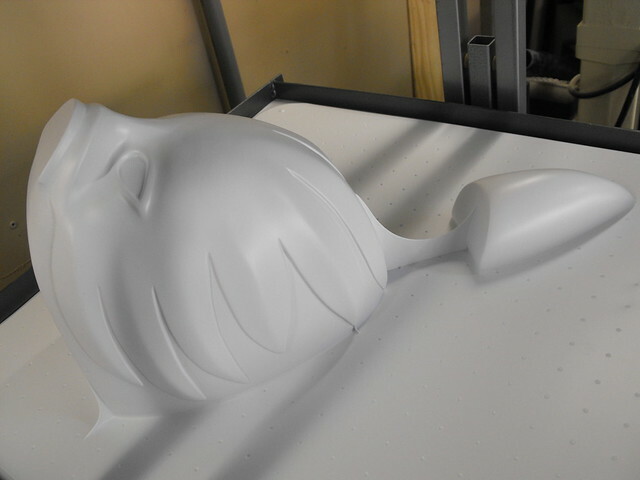 The first pull was done in .040" styrene plastic, which proved to be too thin after stretching over the large form. 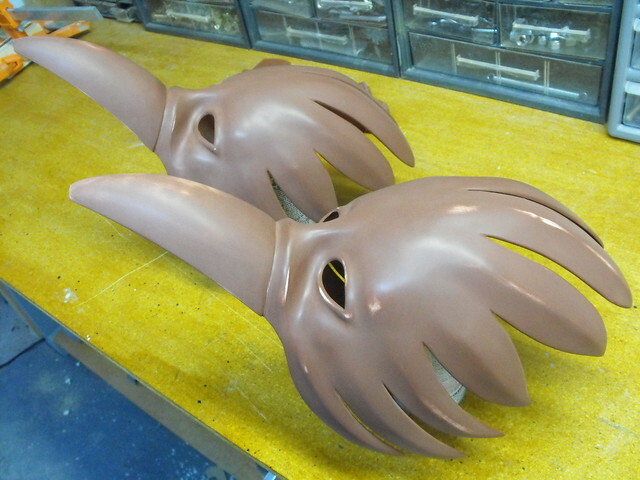 There was also significant webbing when trying to do both pieces at once, so I had to separate the beak and the face sections. 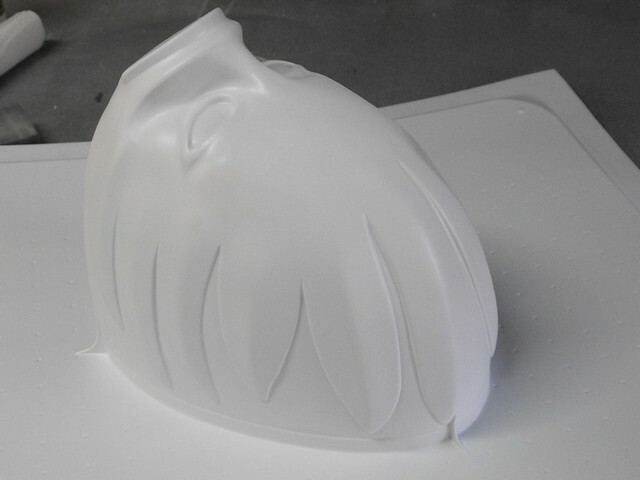 The second pass, done in .060" plastic, was much more successful. 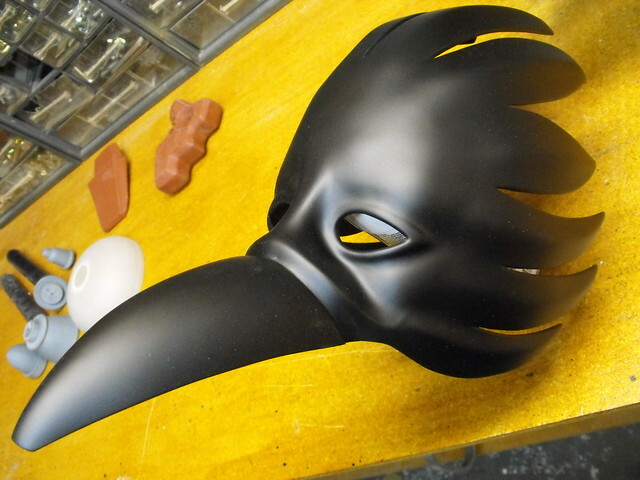 I went through a LOT of test pieces before settling on this finish for the masks. 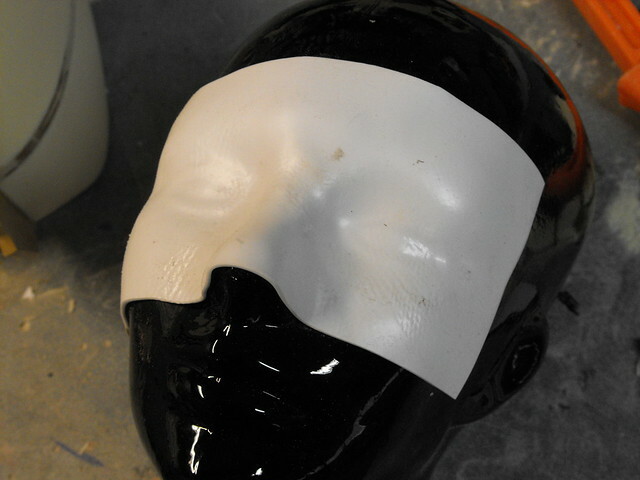 My client wanted a look that emulated cracked porcelain on the white mask. I had about a dozen test scraps before landing on this. 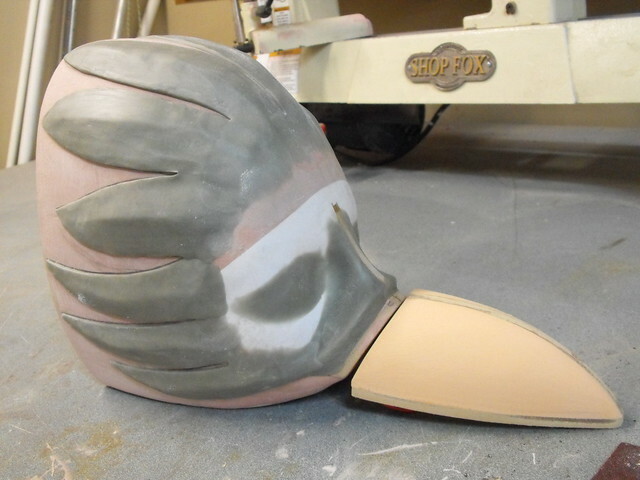 The base coat is the tan seen in the above shot, which was then brushed over with Elmer's white glue. 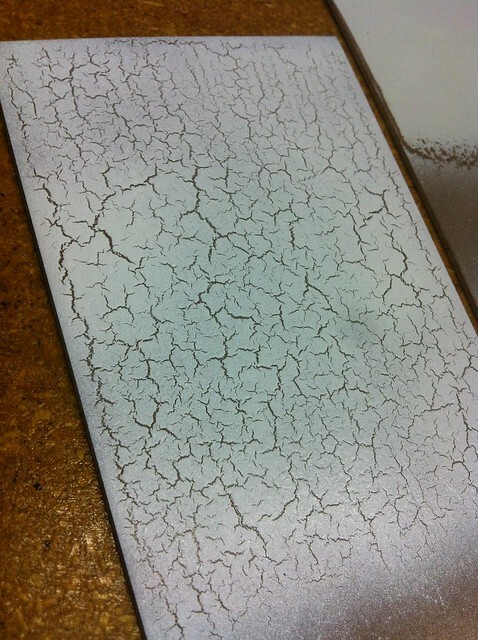 This wasn't watered down, but it was brushed on pretty thin - enough to make the surface appear "wet" but not enough where you could see the white tint of the glue. 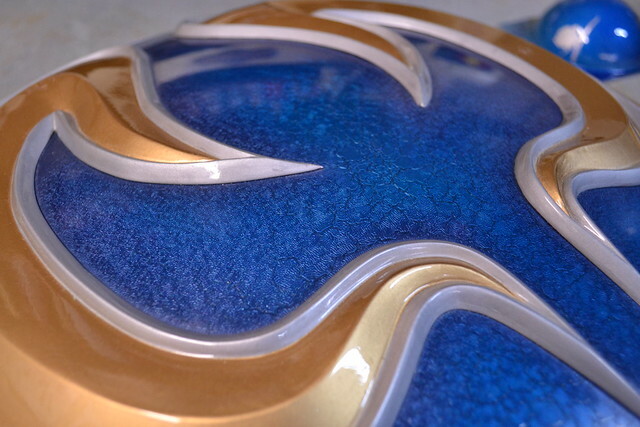 While the glue cured, thinned acrylic paint was airbrushed over the entire part. I found that the cheaper the paint was the better it cracked - I imagine this has to do a lot with how flexible the cured acrylic is. The stuff I used was Blick brand white paint, the kind you'd find in an elementary school. Cheap! 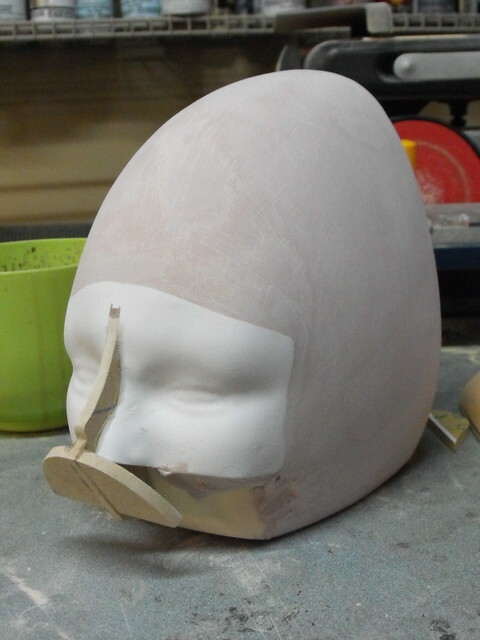 The second mask required a bit more prep. 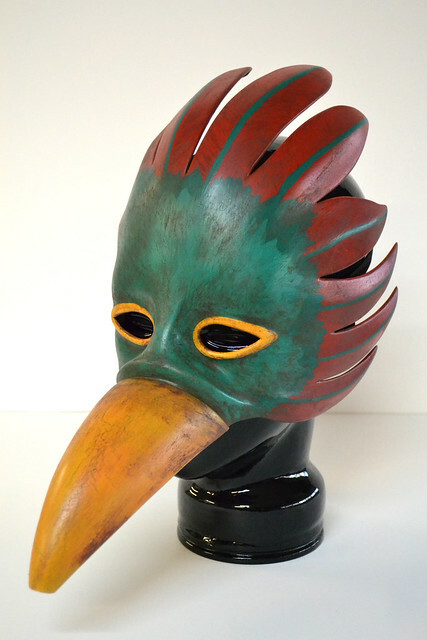 There are only 4 masks like this in Bioshock, worn by the four Splicers that Sander Cohen sends you kill and photograph in the "Fort Frolic" section of the game. 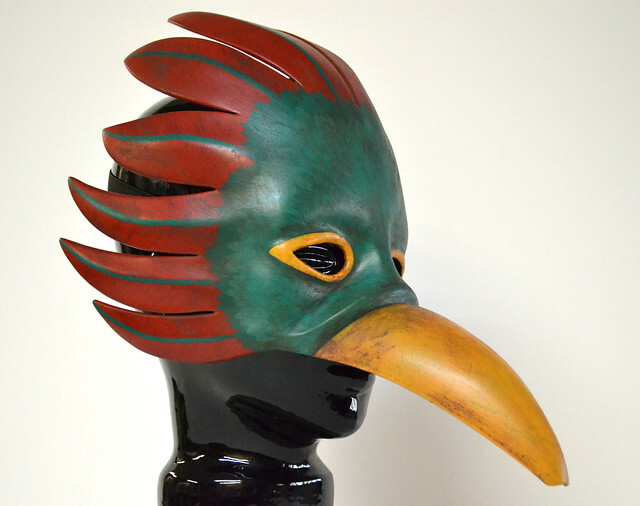 These have red feathers, green feathered paint around the eyes, a yellow beak, and yellow eye accents. 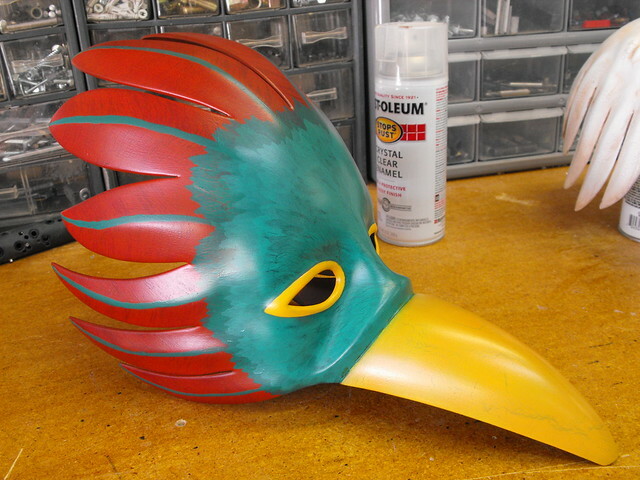 First, the feathers were airbrushed red and allowed to cure, then I used a drybrush technique to streak paint across these parts in a feather-like pattern. 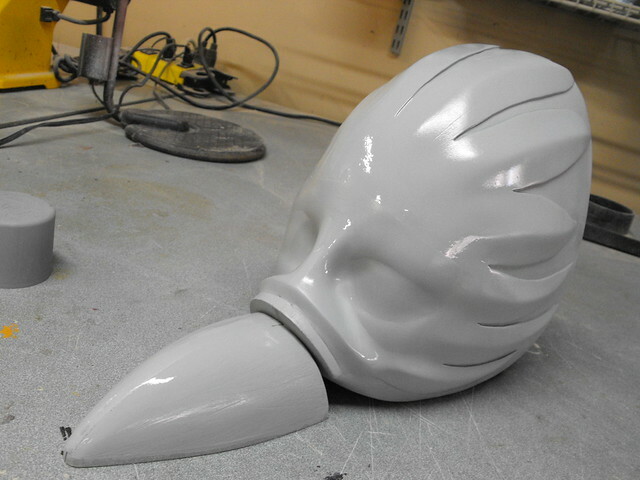 In order to protect these base layers, the acrylic paint was sealed with clearcoat at this stage before weathering. 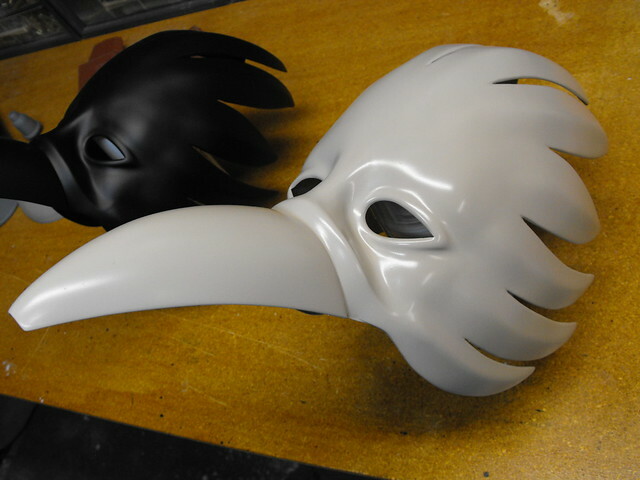 I wanted to make sure that rubbing the grime coats into the cracks and crevices of the masks didn't disturb all the work I'd done already. 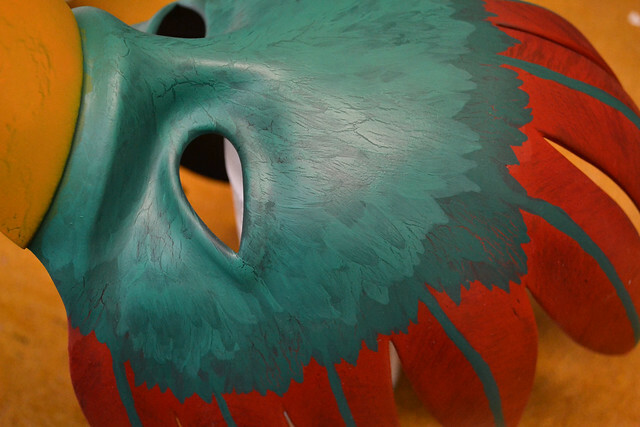 The finishing touch for the Fort Frolic mask was a few passes of dirt and grime, once again done in acrylic paint. I used a damp paper towel to streak the paint across and remove dirt in raised areas while depositing it into recesses. 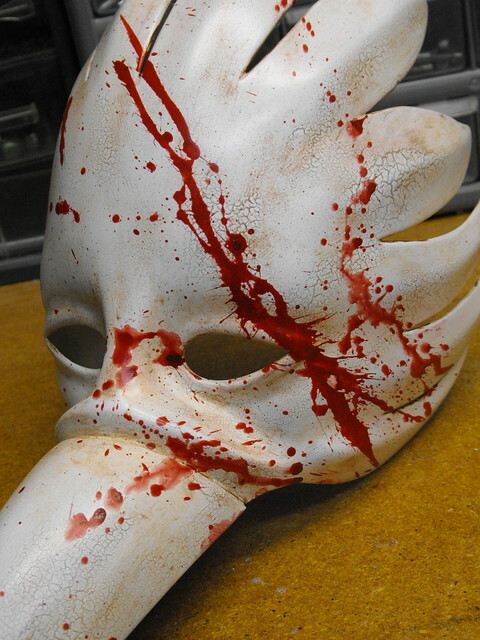 ...blood splatters! It's been a while since I got to do a really fun splat of blood, and this one turned out wonderfully. 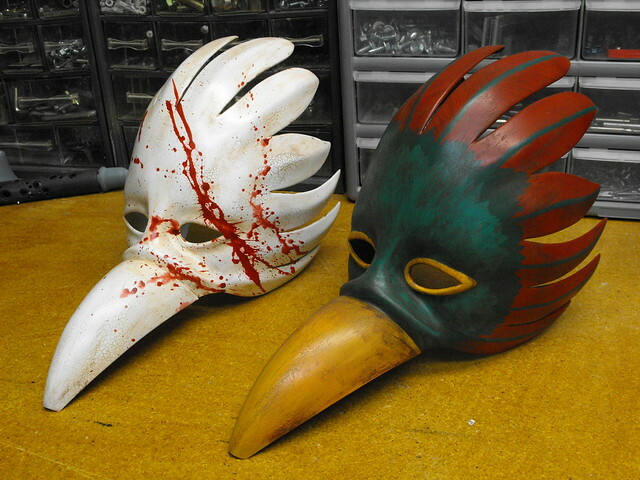 After the acrylic weathering cured, both masks got another pass of clearcoat and an elastic strap was added so they could be worn. 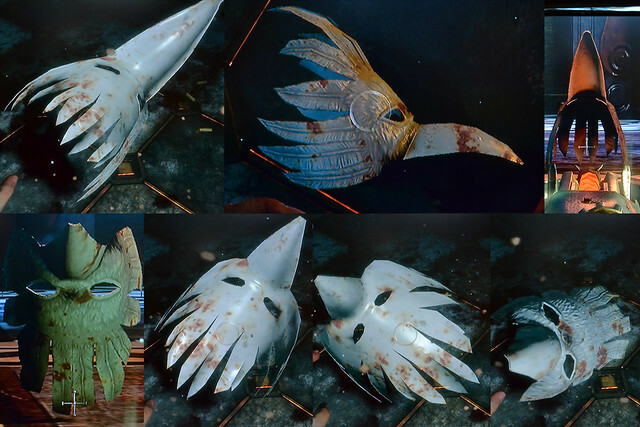 Here are some shots of the finished pieces - if you want to see more photos of them in higher resolution, check them out the gallery. I'm a bit behind on updates - there are still two full armor costumes from 2012 that I haven't written up yet! That said, here's a more recent project with a bit shorter (hah!) write-up that I hope will tide people over in the meantime while I chip away at my backlog. 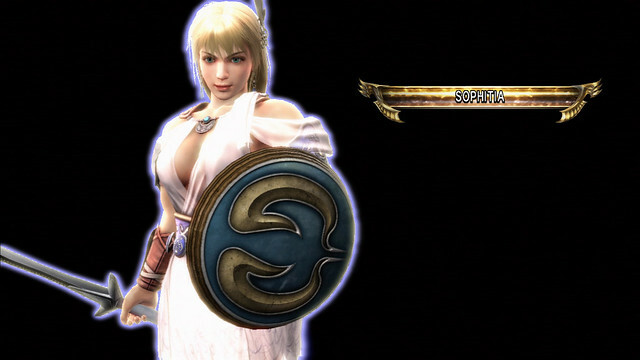 Sophitia's Elk Shield. 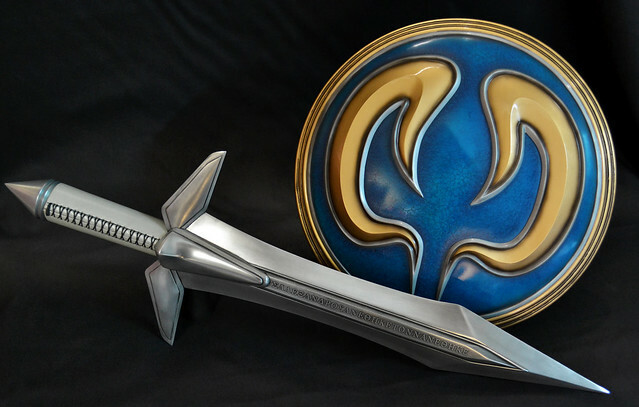 I built this, and the sword to go with it, for Jessica Nigri as part of an upcoming costume. 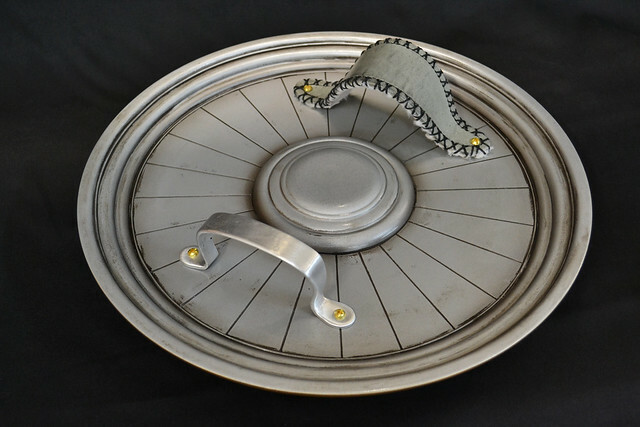 While I've done something very similar to this before, I thought I could make several improvements to the project to make it both lighter as well as sturdier and more interesting dimensionally. Let's begin! 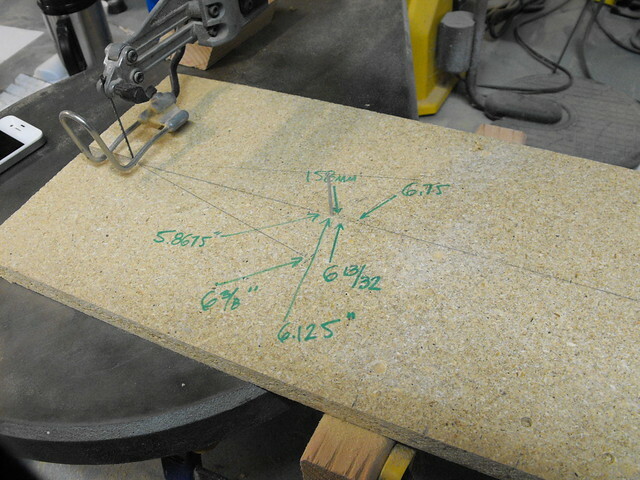 As always, blueprints! If you're interested I do have these available in vector based PDF available for download (as well as all my other blueprints) in my store. 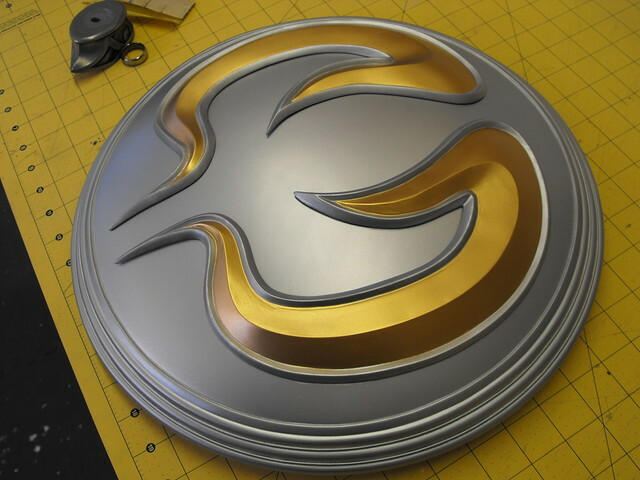 The shield worked out to be fairly small, but it is a buckler after all. 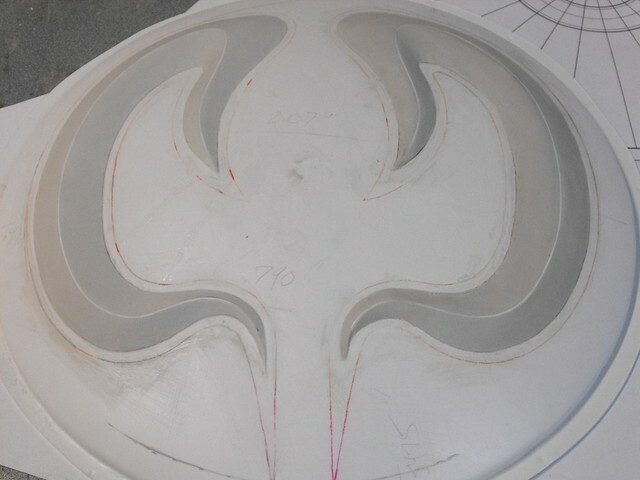 The biggest deviation between this and my earlier shield for Cassandra will be the rounded dome. 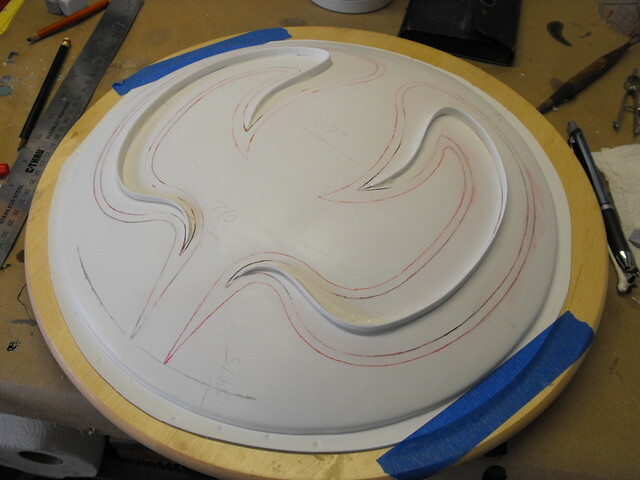 Cassandra's shield is a foam block sanded to shape and resined over, but Sophitia's will be hollow styrene. 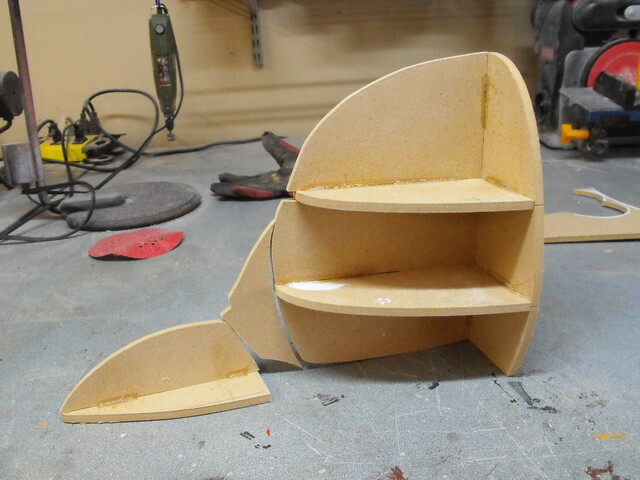 To start off, an MDF platform and raised spines were cut and glued together. 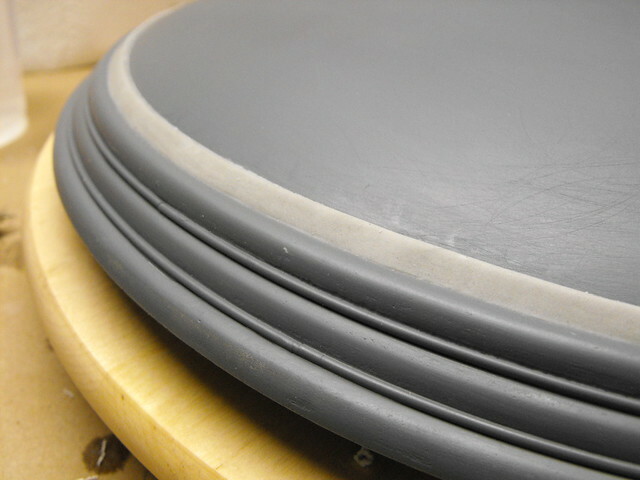 These were filled with blocks of urethane tooling board, then cut and sanded down to a rough dome shape. 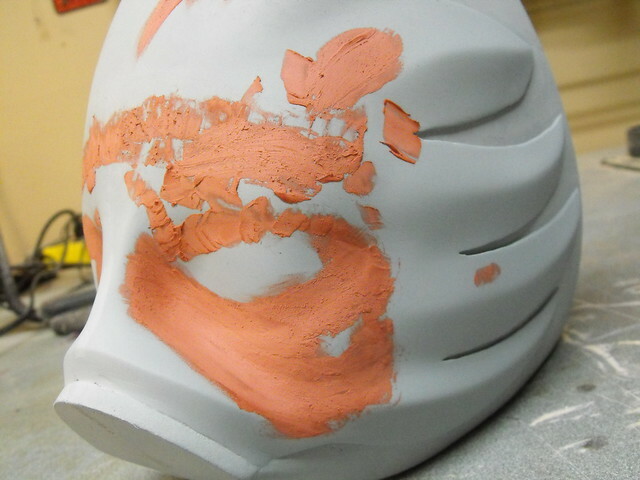 Bondo was used to fill in several of the gaps and smooth out the surface overall. 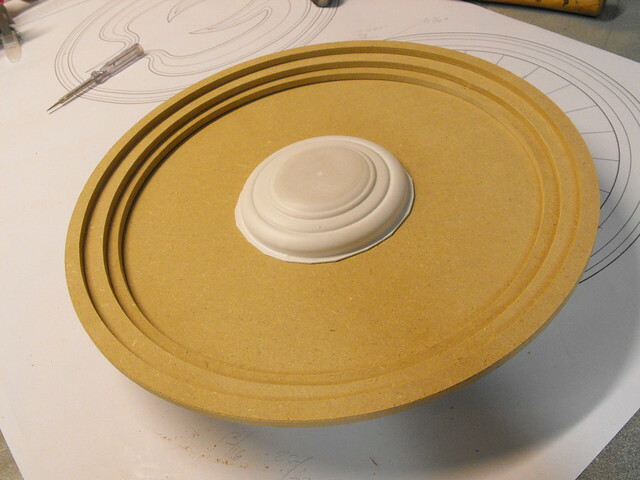 Once it was sufficiently rounded and even, the buck was vacuum formed from .060" styrene to make a hollow shell. 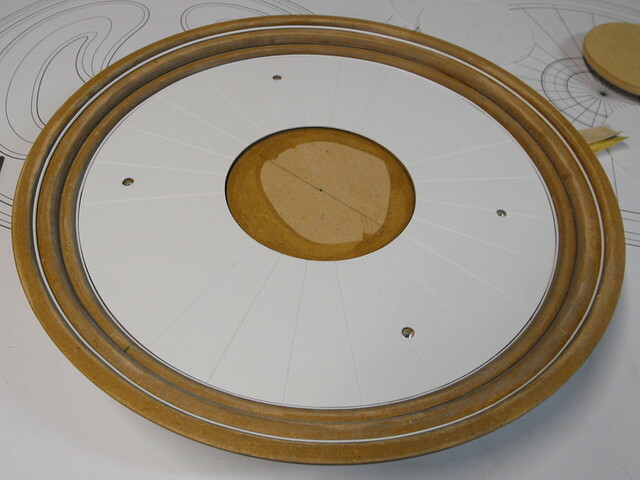 The rings on the outside of the shield are stacked MDF circles. 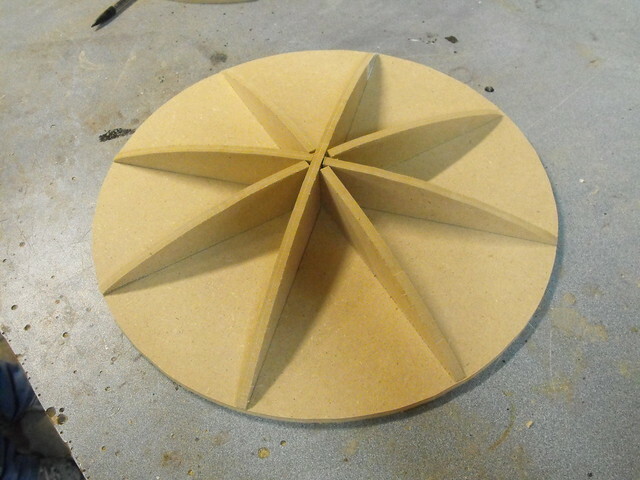 The initial shapes were trimmed on the outer edge with my bandsaw, and along the inner edge with my scroll saw. 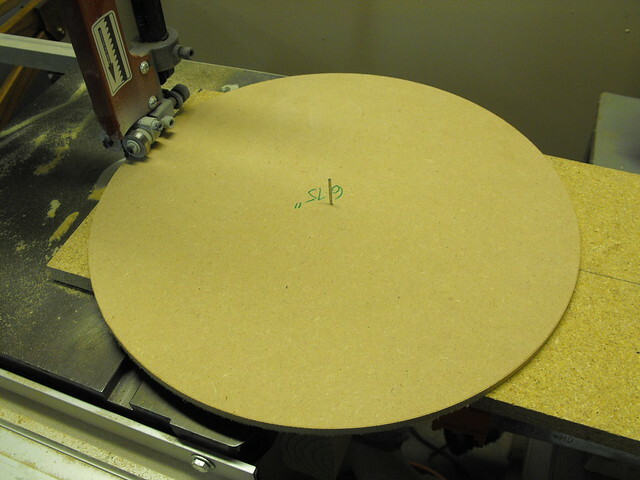 I made a homebrew circle cutting device for this task; essentially a board with a nail in it. 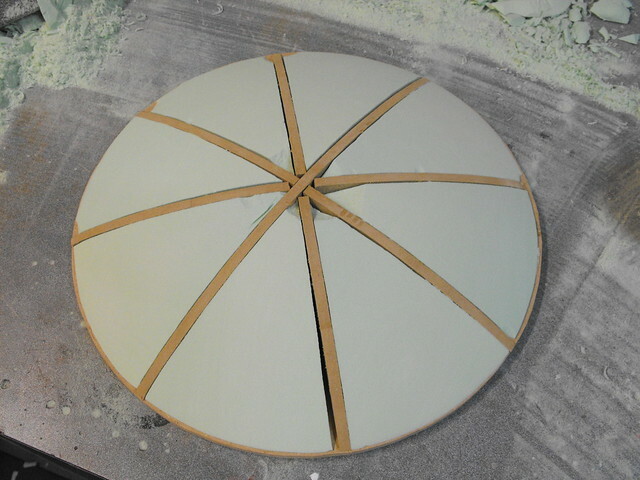 By drilling a hole in the center point of the circle you want cut then pivoting the MDF around this nail, you get a perfect circle from a regular saw. 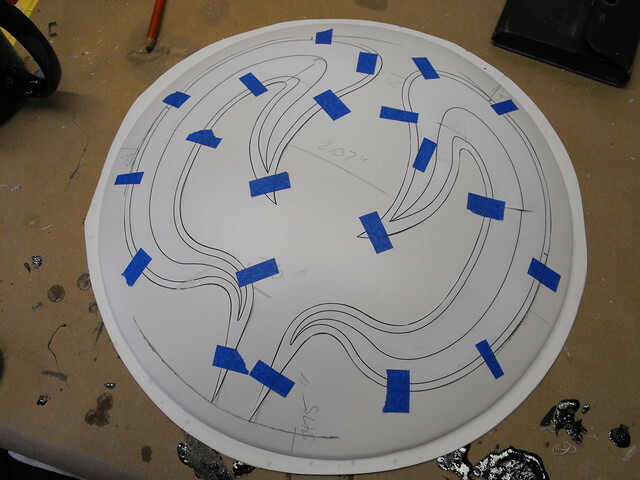 Here's all the rings trimmed out, and stacked on the base of the shield. 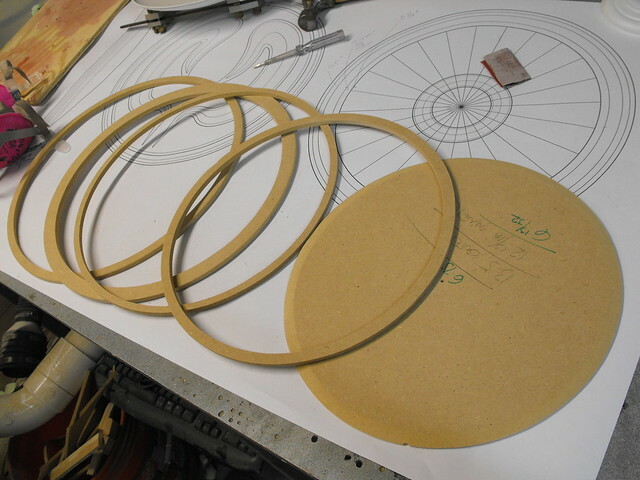 These were all eventually also passed through my table router in order to round off the edges. 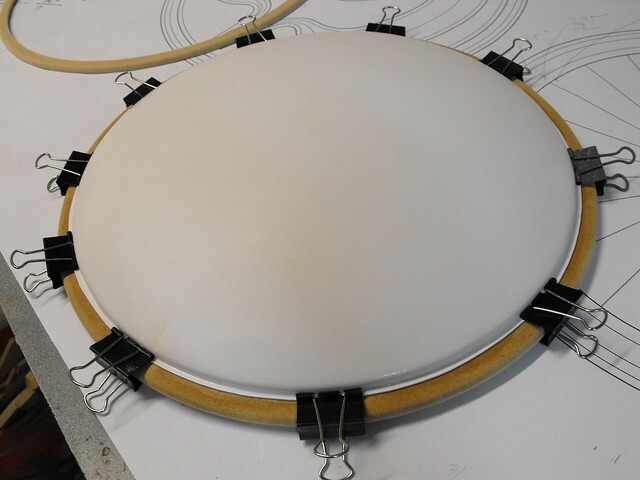 One very thin ring had to be cut to hide the seam of the styrene dome. 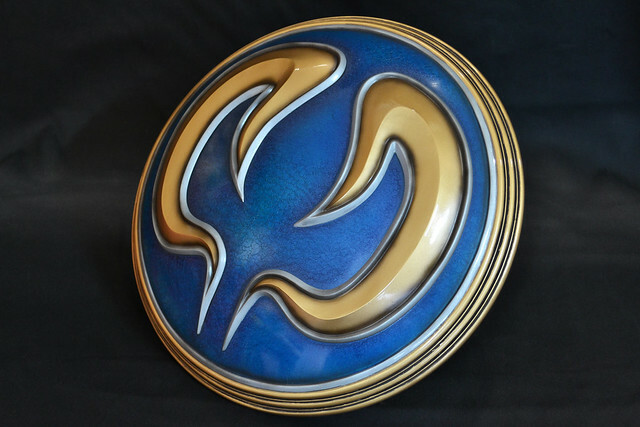 This piece is 1/4" thick and only 3/16" wide, with a rounded outer edge and a concave inner edge. A little scary trimming this on my table router, but it worked out in the end! 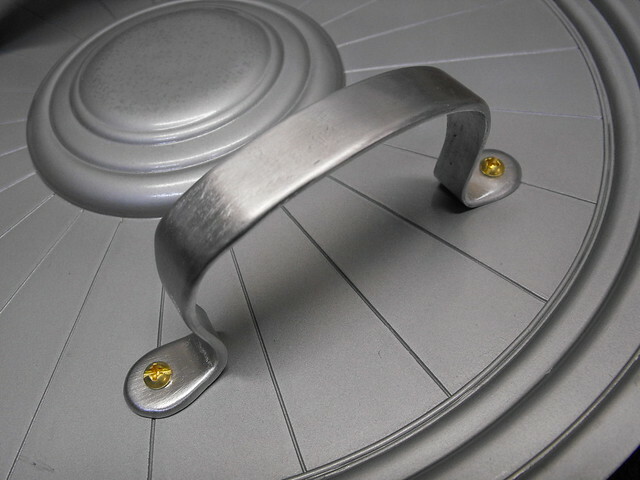 The main baseplate of the shield had T-nuts inserted which will provide mounting points for the strap and handle later on. 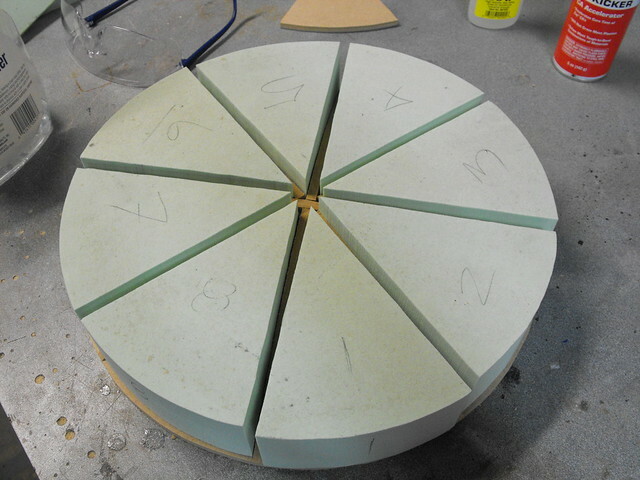 The dome and all the boards were glued together with gap filling superglue and allowed to cure. 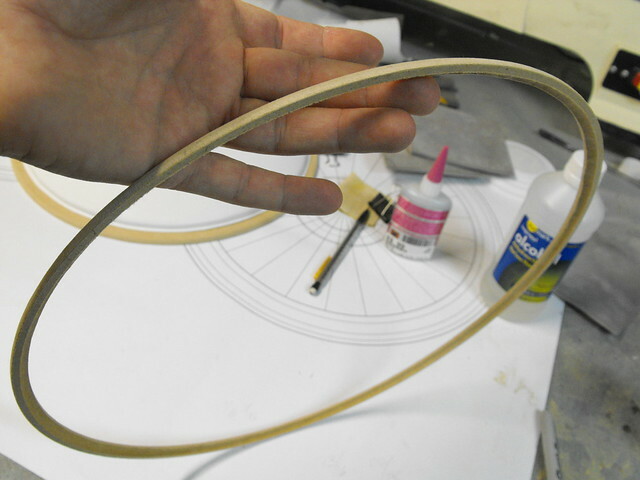 For the detail strip between the levels on the rings, I used round styrene bars in .040" and .060" diameter. 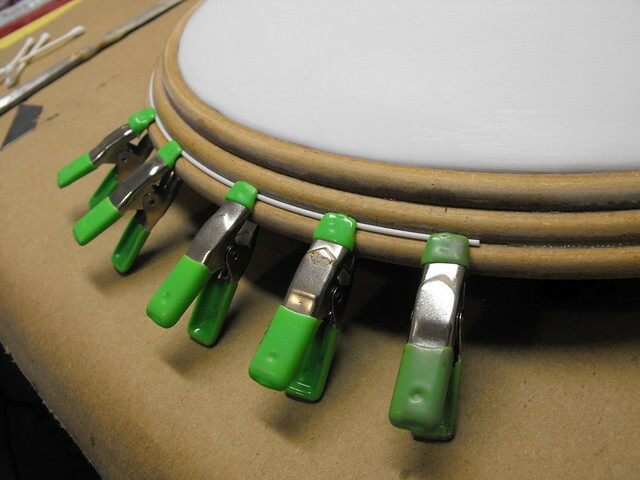 These were glued on one small section at a time to make sure they were flush and even. The process was repeated for the inside as well. 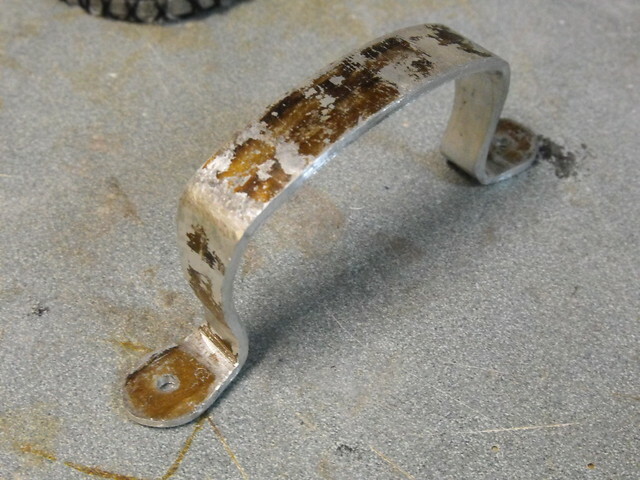 On the backside, a sheet of styrene was scored with an engraving tool, drilled to match the mounting screw holes, then glued into place. It wasn't possible to get small spring clamps to hold the styrene bar in place here, so pieces were taped down while gluing. 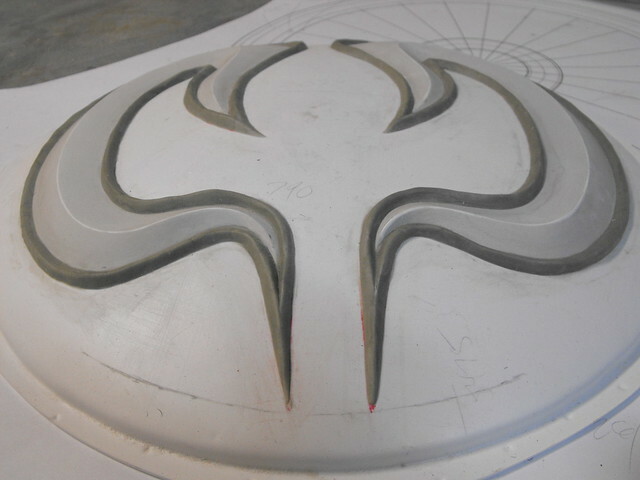 If the center puck looks familiar, I re-used the vacform buck from the Cassandra shield project as they're identical in-game. 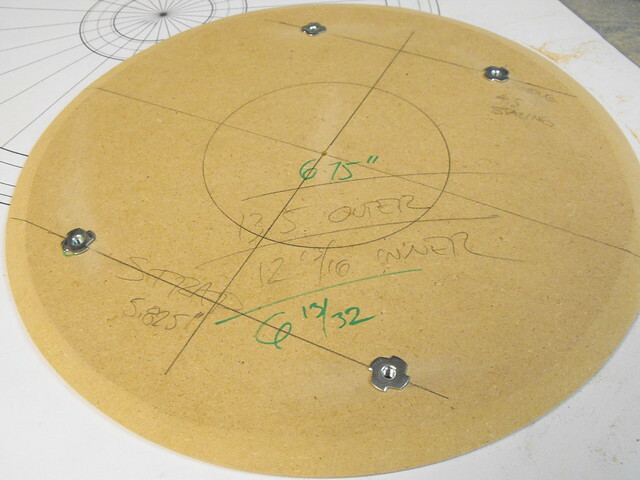 The last ring detail was a flat strip that ran the circumference of the shield right on the styrene dome. 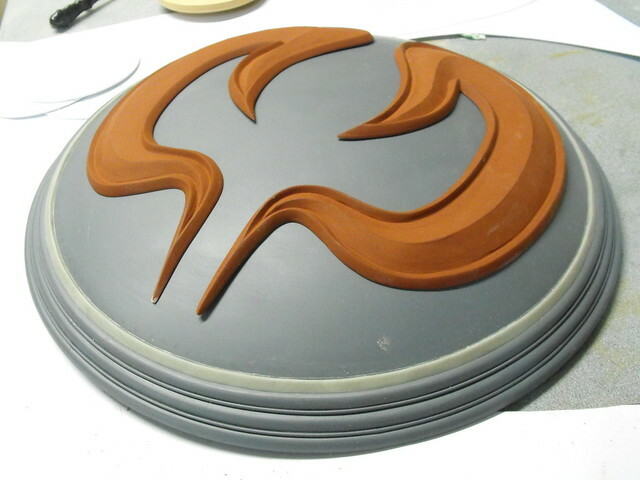 This was sculpted from Apoxie Sculpt then sanded even after curing. 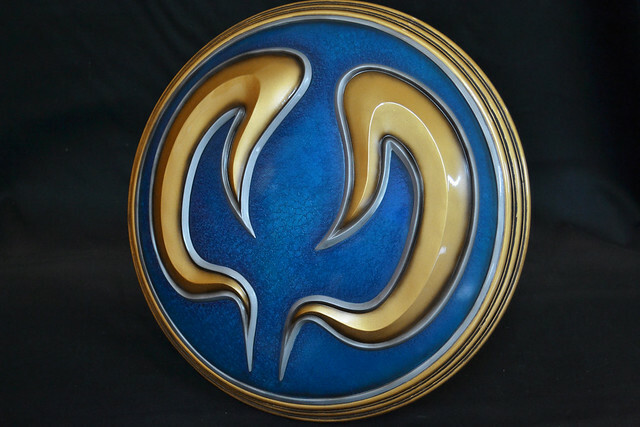 The "elk horns" on the front of the shield were transferred to a second vacuum formed dome by trimming out the pattern to lay flush over the curved surface, then traced. 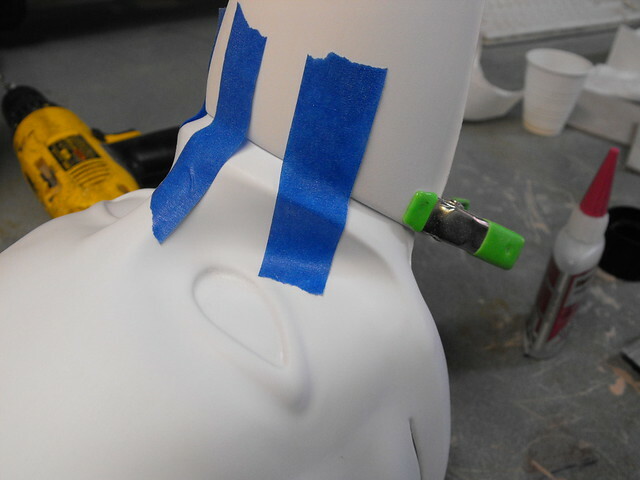 A thin strip of styrene was used to mark the center "spine" of these parts before sculpting. 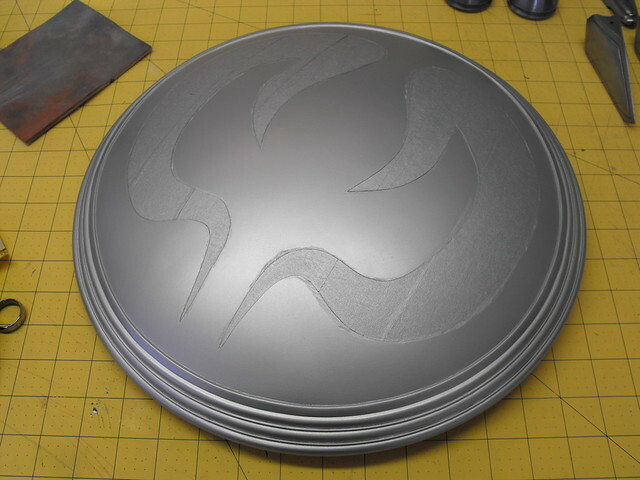 I tried out a new material this time in favor of saving some weight on the finished piece. 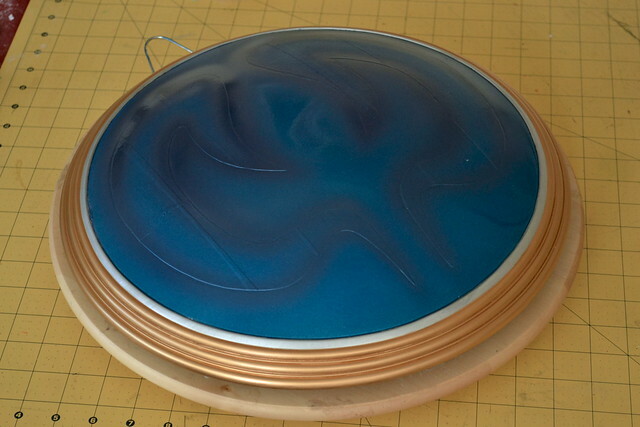 The stuff shown here is Smooth-On's "Free Form Air" epoxy. 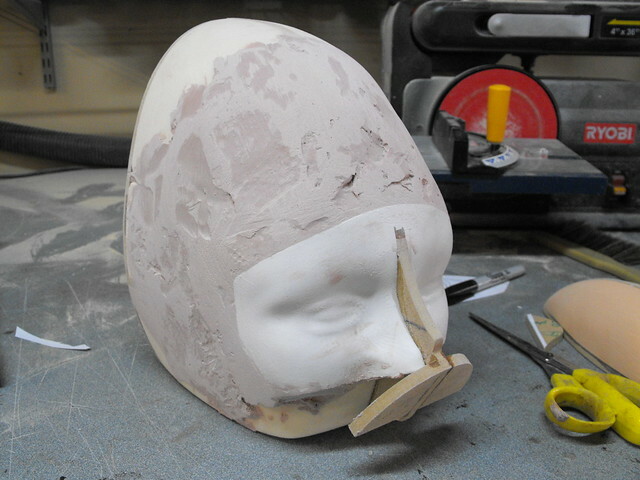 While it is extremely lightweight and dries fairly hard, it is nowhere near as nice to sculpt with as Apoxie Sculpt. 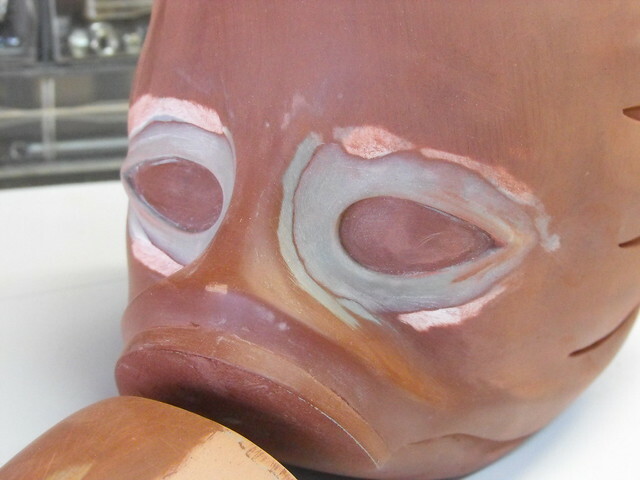 The uncured clay sticks very badly to skin and sculpting tools, and its far too easy to damage the surface with even a light touch while sculpting. It also stinks to high hell. 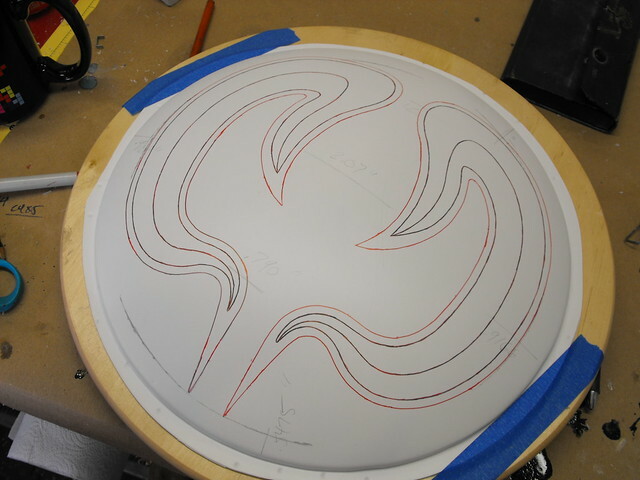 After struggling with this stuff, I switched back to Apoxie Sculpt for the outer trim around the elk horns. 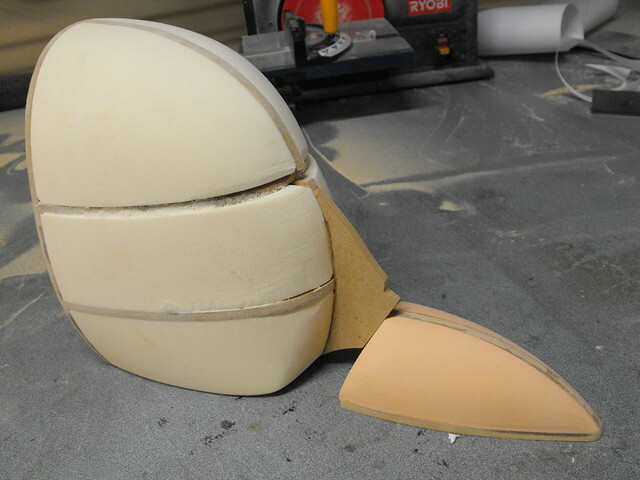 After this cured, both pieces were cut out from the styrene dome and sanded to shape. I had such an elaborate plan for this… and it all kind of went to hell. Let's watch, shall we? 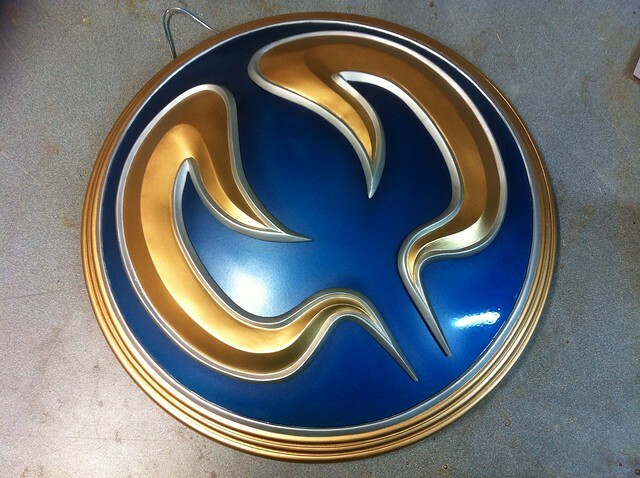 First off, the whole shield was base coated with Testor's Metallic silver enamel. Actually, from here on out, all the paint unless noted is Testor's Enamel. 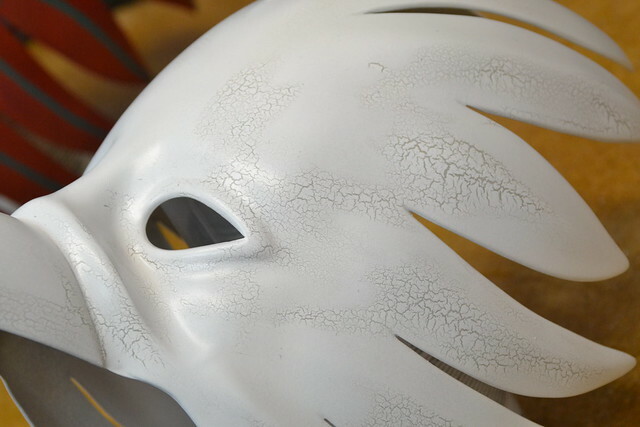 The elk horn areas were masked off so there would only leave bare styrene in place after the paint was finished. This would give me a plastic surface to glue to later. 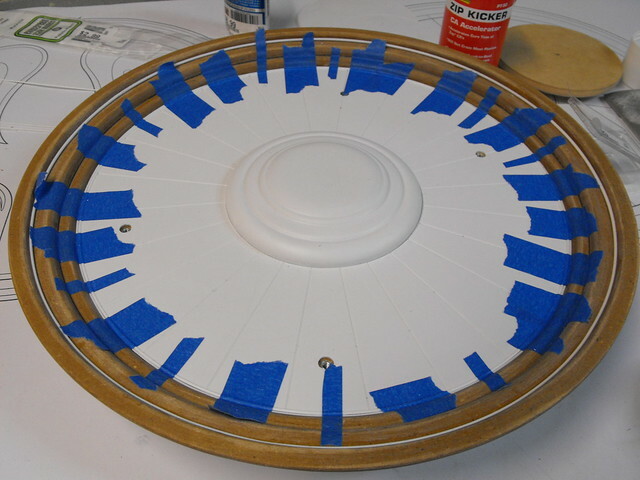 You never want to glue onto paint because that's all the glue will stick to - the very weak adhesion between the paint and your project is what you're actually relying on. 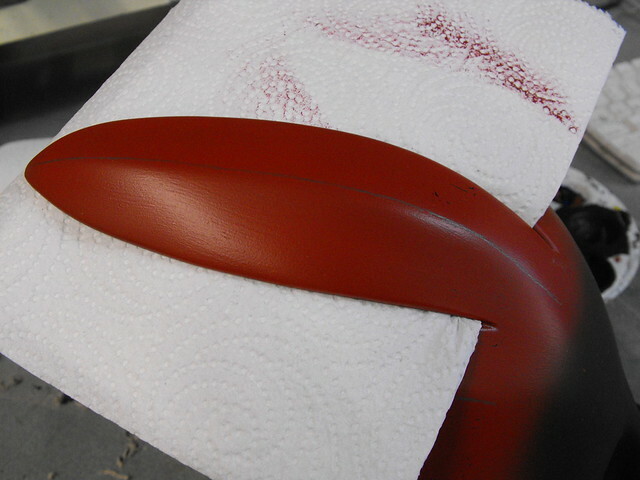 Always make sure to scrape away paint before gluing! 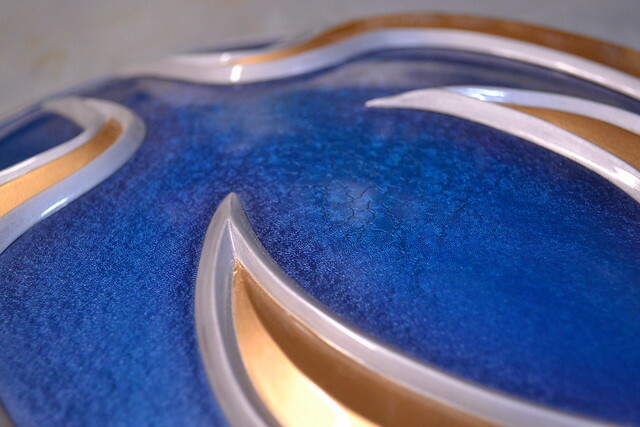 This paint texture was really quite pretty in person - the hue and metallic pigments shift a lot in person and give the shield a lot of depth. 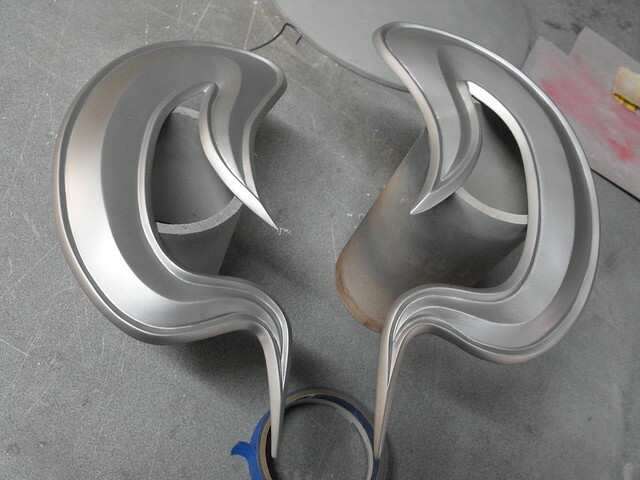 The perimeter of the elk horns were airbrushed on with more Testor's Enamel and enamel airbrush medium. 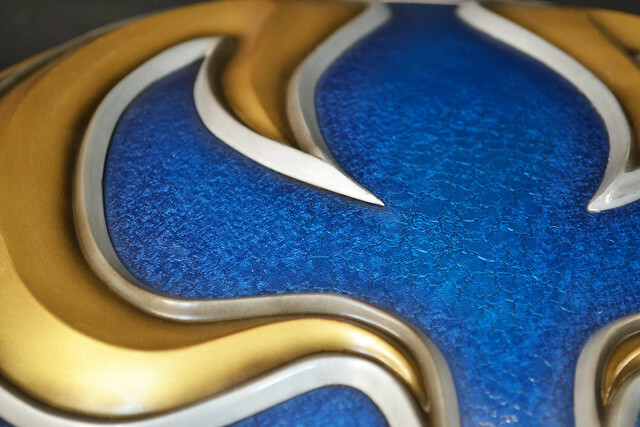 Keep that airbrush medium in mind, it's going to be important in a second. 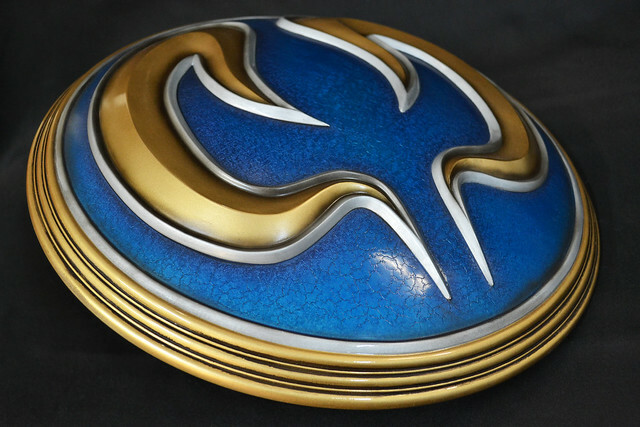 In the photo below the shield looks very very blue - this thing played hell with my cameras (I use a mixture of 4 different cameras when documenting my work) and it looked completely different from shot to shot. 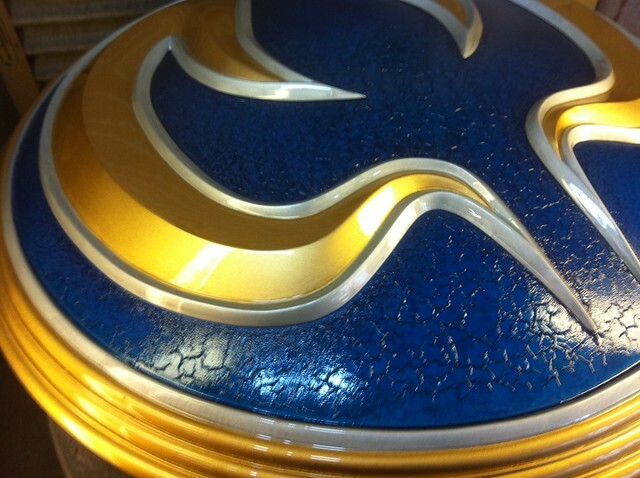 The front of the shield is actually gold (and changes to silver along the outer edge without any sort of seam line at all) so the blue area and the back of the shield were masked off while the outer rim was painted gold. 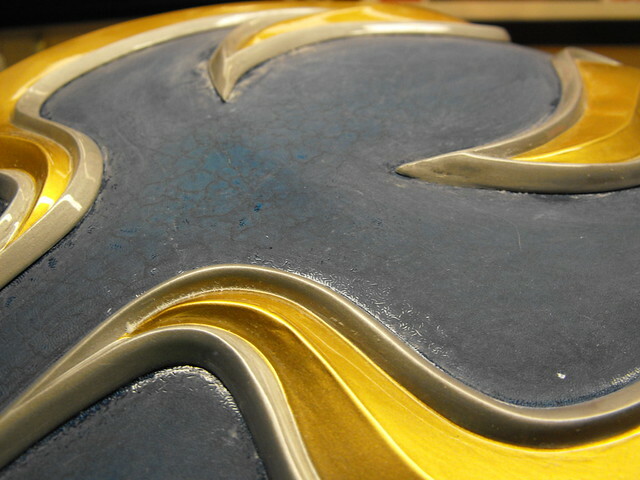 While all this was happening, the elk horns were also painted silver, then masked off and painted gold in the center. …and 2 hours later it gave me a heart attack. This photo is slightly out of focus; I believe my hands were shaking as I took it. 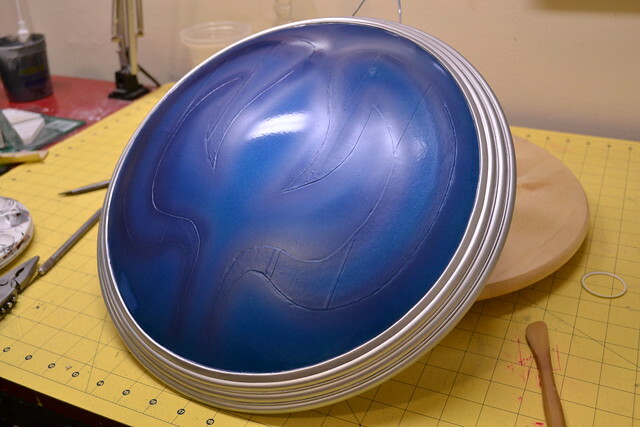 The 2K Urethane clear had been tested on all of the surfaces prior to this numerous times, but I had never tried it over the Testor's Enamel Airbrush medium before. 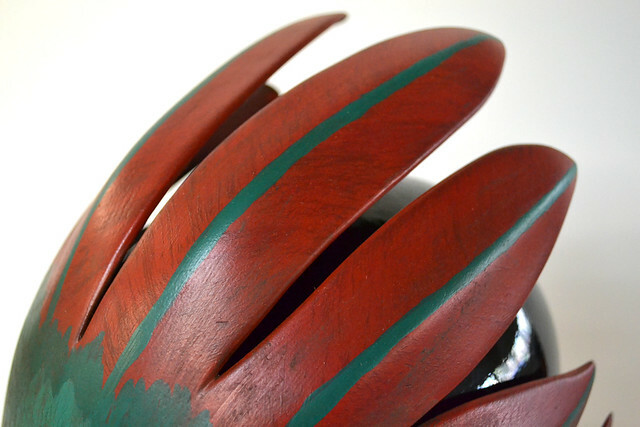 All of the cracking only took place where that specific thinned paint was used. Knowing that now helps me in the future, but at the time I had to choose whether to chisel off the elk horns (thus destroying them in the process and probably damaging the dome as well) and sanding the whole thing back down to nothing, or attempt to salvage this debacle. I decided to salvage it. 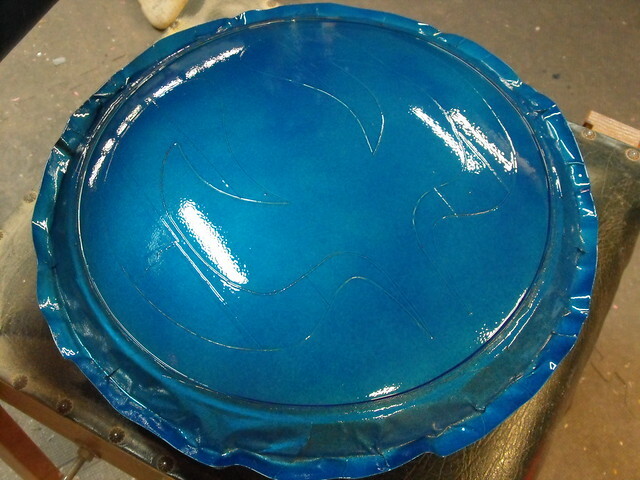 The clearcoat was a rock at this point and all reaction had stopped, so I loaded the entire shield up with clear. 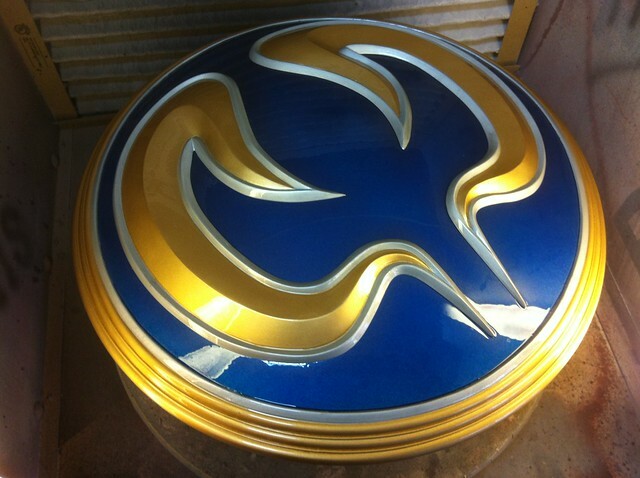 By the end of things, there was probably 1/32" of solid urethane clear on this thing. 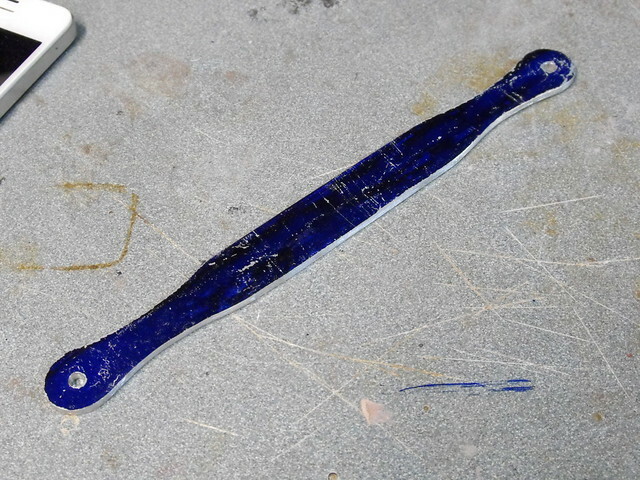 After a few days of curing, I started on the surface with 400 grit wet sandpaper and some soapy water. 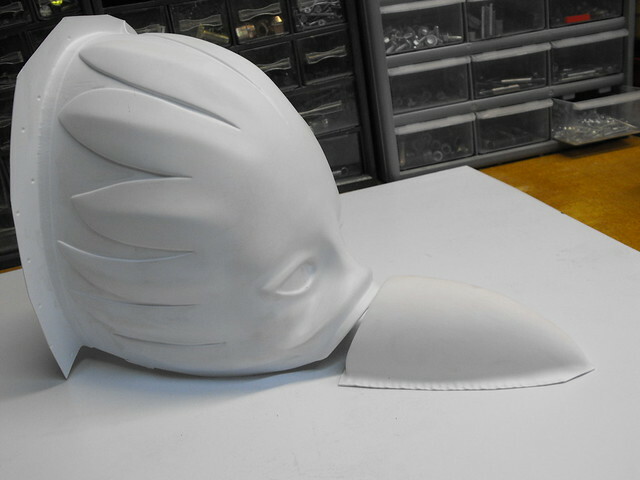 After about 5 hours of sanding, I had gone through 400, 600, 1000, and 2000 grit paper. 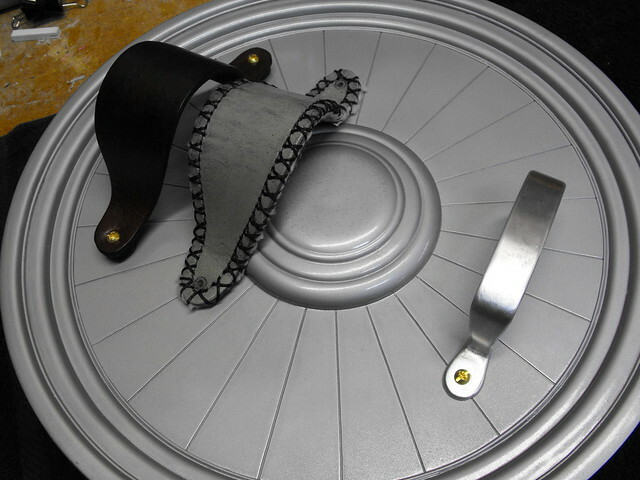 The next day, when my fingers had feeling again, I started buffing the newly smoothed surface. 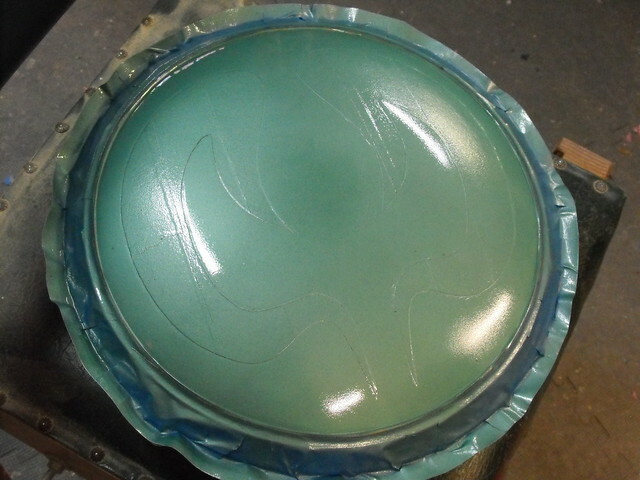 Starting with rubbing compound in medium cut then fine cut, followed by swirl remover, then three coats of tech wax. The results were… well, better than I could have ever hoped for. 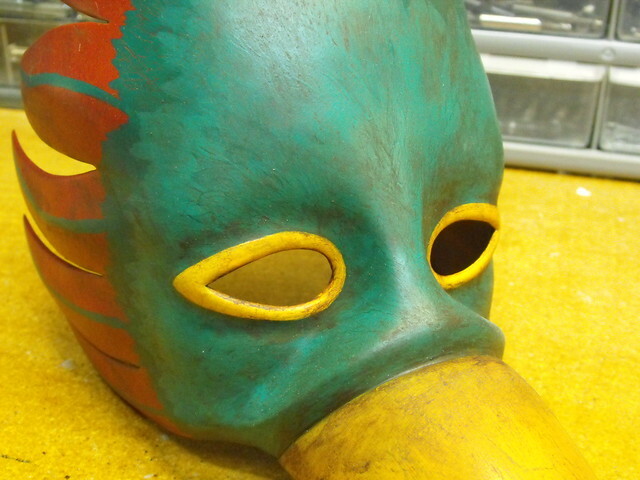 With the paint salvaged (WHEW) I turned back to the last remaining details. 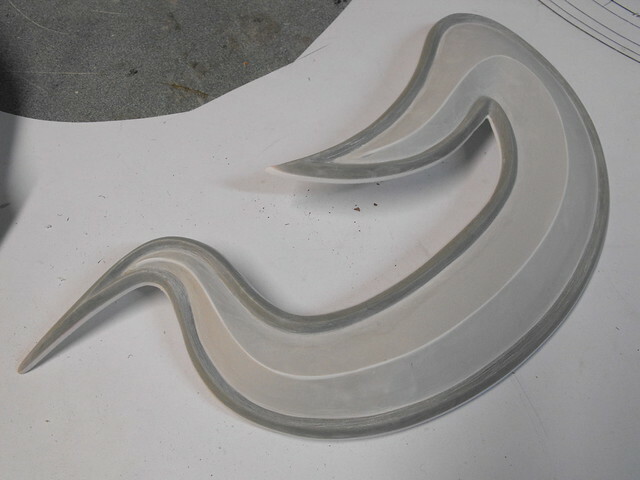 The grip was cut from a piece of bar stock aluminum, heated and bent to shape then sanded and rounded over with a dremel. 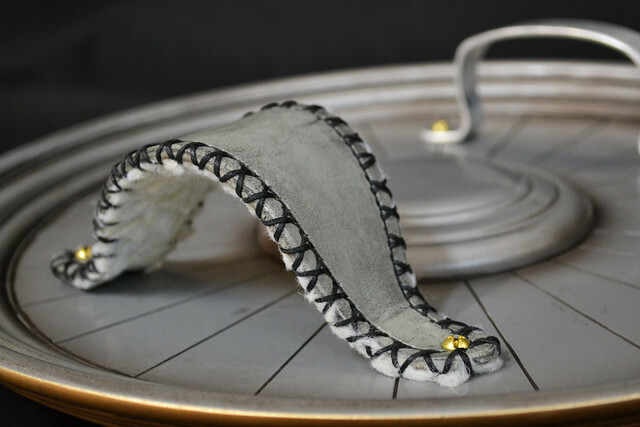 The arm strap was done by my friend Cathy at God Save the Queen Fashions. 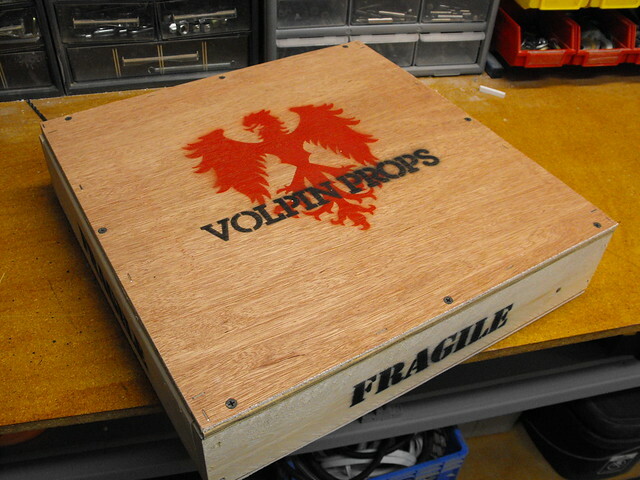 Check out that pro shipping crate! This is how all my replicas travel these days. 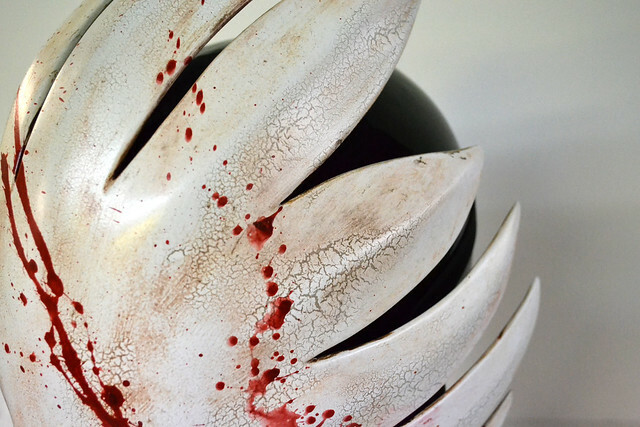 The last detail was some light grime and weathering in the seams of the shield and on the inside of the elk horns. 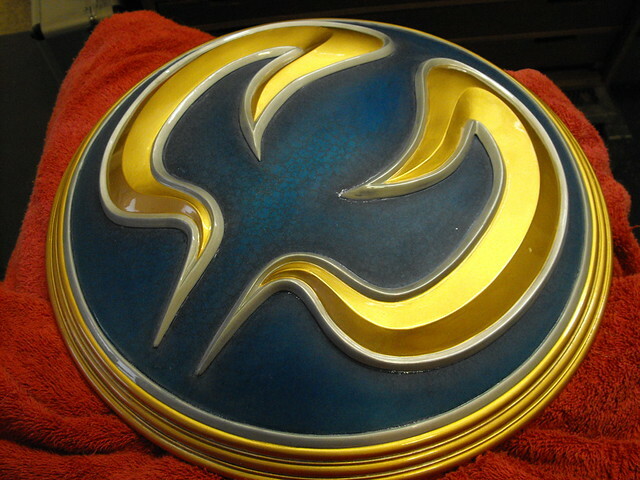 This was mostly done with an airbrush, but pressed into the seams with a damp cloth as well. 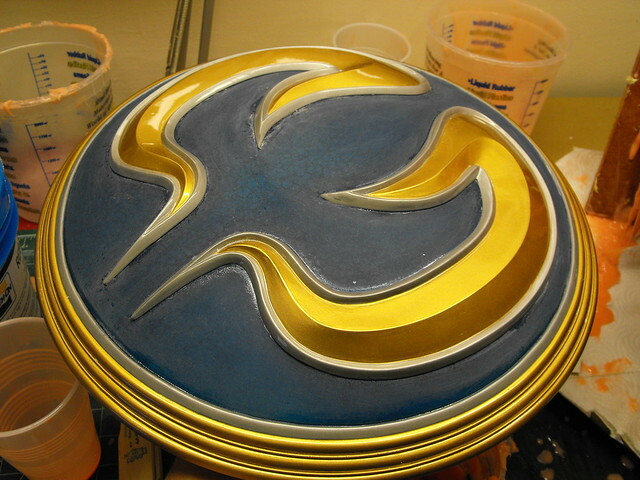 I'm very glad to have salvaged this paint job and lucky as hell it turned out as pretty as it did. I don't want this to ever happen again, but it's nice to know I can pull it out of the fire when it does. 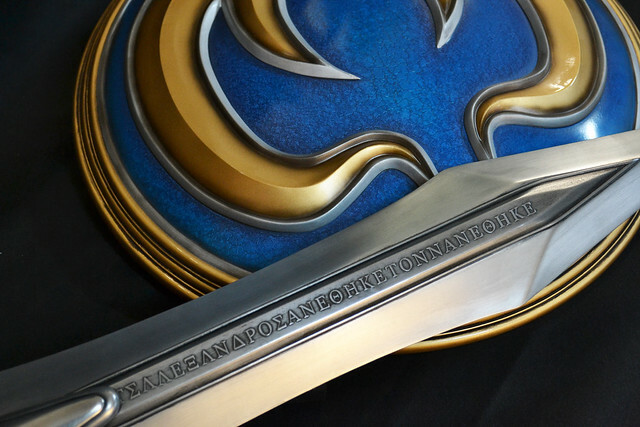 If you'd like to see higher resolution shots of the final piece, check them out in the gallery.